Always looking to do new stuff with a Nest Cam, I thought it would be fun to watch a Nest Cam on a TV screen. Thinking about it, it’s not such a strange idea. Watching video streams on a smartphone, especially for extended periods of time can get cumbersome. Watching a Nest Cam on a TV also begins to approach the functionality found on dedicated security cameras. You can technically keep it going all day. Just be mindful of bandwidth consumption. Reading more and more lately about ISP bandwidth restrictions so don’t exceed the cap if you have one. 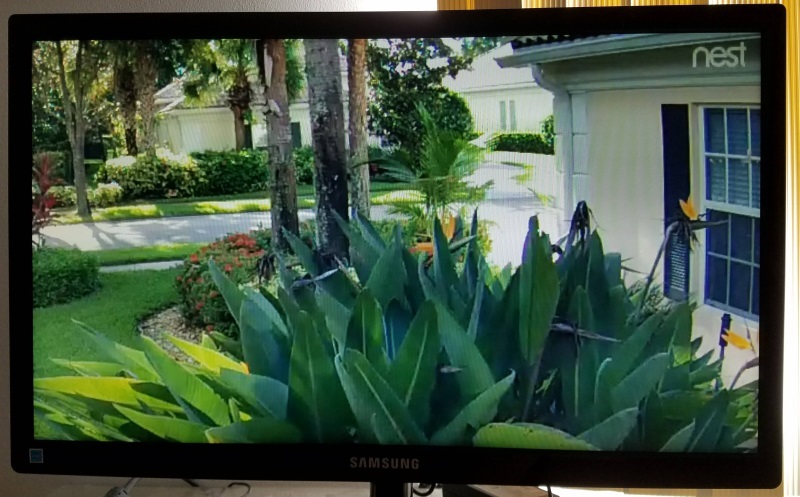 So how can you watch a Nest Cam on a TV screen? Depending upon what devices you have, it might be as simple as installing an app. In other cases, it’s not that easy. The photo that accompanies this article is a Nest Cam on a TV screen that’s using an Android TV box. There’s a Nest app for Android TV. Don’t confuse this with the Nest app on your phone, this is a different app. It’s installed on the Android TV box. One of the best Android TV boxes is the NVIDIA Shield Streaming Media Player. This box does it all and the Nest app will run quite well. There are many other Android TV boxes on the market. Generally speaking, if popular streaming services are supported, the Nest app should work fine. Boxes like the NVIDIA Shield are excellent for watching streaming TV from services like Netflix, Hulu, Sling TV and Playstation Vue. Now, you can also use an Android TV box for watching your Nest Cam or it’s older sibling, DropCam. Just install the Nest app from the Google Play store, enter your Nest account credentials and you will see all the Nest Cam and DropCam cameras that are tied into your account. The Nest app is useful for viewing video on the big screen. That includes video history from a Nest Aware subscription. It’s not useful for changing settings. You will need to do that on a tablet, phone or computer. If you are lucky enough to have the latest 4th generation of Apple TV, Nest has rolled out a live video app. The app will only run on the fourth generation or higher as previous Apple TV models do not support loading additional apps from the Apple app store. Like Android TV, just get into the app store and download the Nest app. After installation, open the app, enter your credentials and you have access to all of your Nest Cam and DropCam cameras. The Nest app on Apple TV provides a little more functionality versus the Android TV version. In addition to viewing video, you can also turn a camera on or off. You can also turn the microphone on or off. You can certainly cast your Nest Cam on a TV using Google Chromecast. Unfortunately this function is only available for Android phones and tablets. While you can install the app on your iPhone or iPad, the function for casting your current display isn’t available on the iOS operating system. This can be used for live or archived video. Chromecast will show whatever is on your phone on whatever the Chromecast dongle is plugged into. Start the Chromecast app (now called Google Home) and get into settings then select Cast screen / audio. A prompt comes up to acknowledge and once that’s done, what you see on your phone or tablet is now on the TV. Turn the device into landscape to get full screen on your TV. Very useful except that you need to keep the Nest app active on your device to see it on your television. Remember, whatever is on your phone or tablet is what you will see on the TV display. I suppose you can dedicate an older phone to this purpose. Just be sure to turn the screen saver off as well as keep it plugged in for power. Nest has a chance to make this real useful by integrating Chromecast into the Nest app. Similar to what you would see with Netflix or Playstation Vue. However as of yet, native casting isn’t built into the Nest app that sits on a phone. Since Nest and Chromecast are owned by Google, perhaps there is hope. You may notice a few notable streaming media devices aren’t mentioned. That’s because there is no officially supported way to view a Nest Cam on a TV using these other streaming media devices. There are back door methods that aren’t supported, and can open you up to security and stability issues, so we aren’t recommending nor discussing them in this article. Using the methods outlined above will allow a Nest Cam to be safely viewed on a TV.